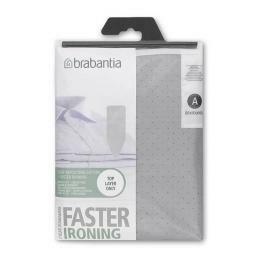 *Please note Brabantia now state that all their 2mm foam backed covers should only be used with a Brabantia universal felt underlay which is available separately. Ideal ironing surface for normal and steam ironing made from 100% durable cotton with a resilient 2mm foam layer for more ironing comfort. Easy to fix with the cord fastener and stretch system ensuring the cover is always smooth and taut. 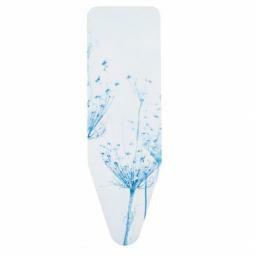 If you have a Brabantia ironing board, the size a b c d or e can be located on your board and your old cover. If you have a different make of board, measure your board and match the size to these covers. It will not matter if your board is a few centimetres smaller because the drawstring can be pulled tighter. You will receive a cord fastener and stretch system with your cover, to make adjusting the tightness of your cover easier. This product comes with a 2 year guarantee from Brabantia. *Please note: The colours may vary slightly from the pictures depending on your monitor and the blue feather colour is blue not green as shown in the picture.